I never wanted to write Star Trek. I just wanted to watch Star Trek, and I wanted the Star Trek I was watching to be better than it was. The Original Series was and remains a milestone in creative drama. Regardless of the cheesy rubber monster suits and low-budget special effects or even William Shatner’s shameless, hammy overacting, Star Trek TOS revolutionized thinking about the possibilities of TV drama. Gene Rodenberry’s hopeful vision of the future not only thrilled and entertained us, it educated us. Some of it was indeed heavy-handed and obvious, but it was done so creatively we didn’t care. As a child, I thought, how remarkable this was, that I could learn something, or at least, be intellectually and morally challenged by something, that thrilled and entertained me at the same time. TOS rarely had a villain. I’m not sure why Trek has gotten into this conventional rut, now, of mustache-twirling villains. In Roddenberry’s Trek, the villain was usually us, our unresolved hatred for one another, our refusal to love, refusal to grow or to learn. Roddenberry gave the Enterprise crew obstacles to their progress, not just cardboard cutout bad guys. I was never interested in writing Star Trek comic books, mainly because most of what I’d seen was pretty bad. Half the work of drafting a comic book script is putting pictures inside your head of what this will look like on the printed page. Most of what I’d seen in Star Trek comics, at Gold Key, DC and IDW, were really bad. Stiff, lifeless, still-born bad drawings allegedly of Trek characters sitting and pushing buttons. That’s the hard part about Trek for comics: the TV show and films largely involve people sitting around pushing buttons. This does not translate well or directly to comic books. Even the best comic book scripts, many of them written by the brilliant Peter David, just looked incredibly dull. There were the rare and unique occasions of a brilliant script, say by PAD and others, and some really great art, but those were in the minority. Trek comics, for me, just sucked. I was and remain concerned that, even if I had an idea for Trek, which I didn’t, that writing the script would be an uphill battle for me because I’d be fighting against muscle memory of scripts ruined in the past by bad art or by artists more concerned with a fast paycheck than they were in investing in good work. My one Trek idea—of Worf’s bridge commander test being manipulated by Starfleet to prevent his ever becoming captain—was borne, I believe, out of a TNG episode in which Counselor Deanna Troi takes the bridge commander test and learns yawn obvious lessons along the way. I recall thinking the episode would have been a lot more interesting had that been Worf and had Riker, et. al. known that, no matter what Worf did, he would never be promoted. A full commander could be given his own ship. Even a routine act of bravery could promote a full commander to the rank of captain, and that would never happen for Worf, due to either institutionalized racism or to some secret pact forged between the Federation and the Klingon empire. The idea just sort of rattled around my head, I assumed it was an obvious idea that would eventually get done in some way. Instead, Trek film after Trek film went to a great deal of trouble to explain Worf’s presence in the movie while doing nothing with him. Worf was always a major disappointment for me. With the notable exception of the brilliant work done by Trek writer/producer Ronald D. Moore, nobody seemed to know what to do with Worf. He was hot-tempered, immature, and despite being both a Klingon and alleged combat expert, he lost virtually every fight. He was an enormous joke, talking all this tough Klingon warrior speak, but Worf was, time and again, the first guy on his back during the Enterprise’s many forcible boardings. Worf’s suggestions were overruled not only as a matter of routine but as an icon of the series. In fact, I cannot recall a single TV episode or film where Worf’s strategic recommendations were accepted, followed, and/or proven right. Chief Engineer Geordi LaForge provided a bit of ethnic balance to the series, as the writers’ continued humiliation of Worf verged on a kind of minstrel theme which I found marginally offensive. He was an idiot, braggart, and far too immature to even have bridge clearance, let alone serve as security chief. Ronald Moore’s Worf, who stepped off of the transport shuttle in the fourth season premier of Deep Space Nine, was so vastly different, such an utter repudiation of the caricature actor Michael Dorn had been stuck with for nearly a decade, that it made me wonder if Dorn had made the transformation a condition of his reprisal of the role. In the two-part premier, “The Way Of The Warrior,” Worf was a mature, confident, clever, focused, complex, highly-skilled combatant and key advisor to the series lead, Captain Benjamin Sisko. Dorn was able to stretch as an actor beyond the cartoonish beats of TNG and explore reams of depth within his character I, frankly, didn’t realize were there. If you’ve never seen DS9, seasons 4-6 constitute some of the best television episodes ever filmed, Star Trek notwithstanding. They are, however, a considered departure from Gene Roddenberry’s lighter and more benign vision (for which DS9 received withering criticism), but I always thought DS9 existed for what it was: an tougher and more adult exploration of the themes Rodenberry’s vision provoked. Post-DS9, Worf went right back to being a cartoon in the TNG film franchise. His singular memorable moment was in confronting Picard’s irrational behavior—an amazing switch for these characters, as it was, traditionally, Picard talking Worf down from the ledge. I chalk that moment up to Moore, though I have no way of knowing which parts of Star Trek: First Contact belong to Moore and which to co-writer (and bane of TNG) Brannon Braga (though I can certainly make educated guesses: the good stuff was Moore, the stuff you hit the skip button o your remote for were likely Braga). ST:FC was also, to my immediate recollection, the only time Worf was left in command of the Enterprise, other than the a brief glimpse of him in the captain's chair in the closing moments of Season Four's "Data's Day," and the TNG episode "Time’s Arrow," where Picard orders Worf to take command when he and his entire senior staff head back in time to rescue Data (to, I suppose, avoid having to deal with having a black man with them in the late 19th century). Worf in Picard’s chair, even on the incomprehensibly stupid puzzle layout of the Enterprise-E bridge, was a brief moment in the film, but, I assure you, Worf fans (and, likely, all African American Star Trek fans) were extremely pleased to see Picard return to the ship and find Worf in the command chair. I’ve no doubt I was not the only one thinking, It’s about damn time. For the remainder of the spectacularly wasted TNG film opportunities, Worf was, as was Dr. Beverly Crusher, merely a voice in the chorus. I, frankly, do not know why Dorn (or the tremendously talented Gates McFadden—an actual actor) continued to show up. Worf was completely wasted, returned to being a bumbling incompetent. My Worf is the guy from “The Way of The Warrior.” Confident, capable, experienced. Cunning, decisive, a very strong leader. And, as evidenced early into my Inquisition story, wasting his time in Starfleet, an echo of personal experience. I remember sitting at a pub with artist Mark D. Bright, giddy over the blockbuster success of our story, Spider-Man vs. Wolverine, and stupidly thinking that book’s huge numbers would open doors for us. Numbers like those would absolutely have opened doors for anybody else. But our phones never rang. We were never invited back for a sequel, and Marvel passed—twice—on sequel pitches from me. The conventional wisdom attributed the book’s record-breaking numbers to the characters; the talent had nothing to do with it. While, at the same time, we were routinely denied opportunities because our names weren’t big enough—claims that comic sales were predicated upon the names of the talent associated with them. Which one was true? For Mark and I, both; whichever answer justified the “no” we constantly received. At some point, I recall telling Mark that I knew, from that experience, I would never be offered X-Men or any real opportunity to succeed in the business. After all, if it were the characters who sell comics, putting me on an unsinkable ship like X-Men was hardly a risk; my work would be judged on its merits. If it is the *name* that sells comics, then putting me on Hawkman was an utter waste of time (but thank you, Paul, for doing it anyway). This, for me, was the missed opportunities of Worf, likely because Worf has been traditionally written by people who could not possibly understand what a complete gut punch it is to live under that glass ceiling. To do your best and to, in many areas, out-perform others whose efforts were rewarded and who were given opportunities you never would be. Knowing, for a fact, I’d never be offered Superman or X-Men, that I’d never make Group Editor, let alone EIC. Peter David, a brilliant writer, friend and once-fellow sufferer of Marvel Stigmatization, was at one time rumored to be merely a pen name for me (which was ridiculous; our writing styles are very different). He was ostracized unfairly and given an enormously hard way to go, but he more than succeeded, becoming, in fact, an industry legend. If his work had, at least early on, been mistaken for mine, why were opportunities made available to him that weren’t made available to me? Some of that, likely most of it, was Peter himself. Peter was simply more ambitious than I’ll ever be. Peter kept knocking on closed doors while I just refused to beg these people for anything and moved to Colorado. Peter built success upon success, whereas, no matter how successful anything I might have done might have been, nothing I ever did provided for me a platform sturdy enough to build a career upon. Today, in 2011, right now, when industry insiders read this, they’ll roll their eyes and accuse me of whining. This is the insidious nature of institutionalized racism: it is, at its core, an impossible conversation. You are victimized by racism, then stigmatized for simply bringing it up. To look at two guys, their writing once mistaken for being from the same person, both Marvel staffers working less than a hundred feet from one another, both initially disliked personally if not intensely by the editorial staff, starting from essentially the same time and from exactly the same place, and completely discount even the possibility that race played any role whatsoever in their disparate career tracks, is a denial of the obvious. This is a weight around the shoulders. You manage to move forward in the occupation you love, but it is a shuffling lumber rather than a march. You know your horizons are limited. This is the Worf story I was waiting for somebody to tell. Worf 2.0:: Ronald D. Moore fairly recreated the character, jettisoning Worf's buffoonish incompetence from the moment he stepped onto space station DS9. Finally respected and taken seriously, DS9's Strategic Command Officer kept the comic flourishes while plumbing greater depths of actor Michael Dorn's iconic portrayal. J. G. Hertzler plays Martok. I will, at some point, post my rewrite of Star Trek: Nemesis, a film so bad I just started fixing the screenplay for fun, but ran out of time. Working on the script, I came up with my one and only original story idea for Star Trek, which I just tossed in a drawer and gave absolutely no thought to until I was approached, for whatever ungodly reason, by IDW, seemingly out of the blue, to develop something for them. We were not talking specifically about Trek, but IDW had the Trek franchise, and I said, “Oh, hey—you guys do Trek, right? Well I only have one idea for Star Trek, but I’d really like to do it.” So I pitched them the idea that later became Star Trek: Inquisition, which was to be a three and then later five-part story. But a couple things happened: first, Paramount bounced the story as too edgy and controversial. I can’t imagine what’s become of Trek that they now shy away from controversy, but the licensing folk up there (at least, at that time) really didn’t seem to get it that Roddenberry’s Trek was all about controversy, cached in metaphors of half-black and half-white species. The notes back from Paramount lent the impression, for me, anyway, that Paramount or Trek felt like this story was accusing them of something. Their general points green-lit the story so long as we removed the core, the perceived racial bias against Worf. IDW's editor discussed this with me, but my position was this was the only story I was interested in telling. Green-lighting the B and C stories was nonsensical if we're not allowed to tell the story we're trying to write. The licensing folks seemed to me like clerks reading from static guidelines and over-protective of corporate interests. They seemed to know the nuts and bolts of Trek while not understanding its soul. They were not creative people, but administrators insisting we round all the edges and pull the wings off this particular butterfly. IDW seemed willing to go a few rounds with this, but then Abrams Trek came along and re-shaped the landscape. My story is TNG Trek. Once Abrams Trek became a going concern, director J.J. Abrams had the right to approve all Trek-related material, even stuff like my one idea which had absolutely nothing to do with what he was doing. So now we had to appease Paramount and Abrams, and the window for TNG material at IDW narrowed as Abrams Trek’s release date approached. That window remains narrow. I've finished the script mainly to get the story out of my head. I cut a B-story dealing with Picard and the Breen which was added, at IDW's request, to flesh the arc out to a more trade-friendly five issues. 2013 Note: Abrams' shockingly derivative follow-up, Into Darkness, used two key elements from my IDW pitch: the underwater starship and the "Black Pearl" version of the Enterprise, essentially the EE painted black. Neither are terribly original ideas, but both appeared in summaries submitted to Paramount and Bad Robot. Today, in 2011, is it more difficult for a black officer to achieve command status than it is for a white officer? I don’t know. Emotionally and viscerally I am quite sure it is, but that’s just my racism speaking. Racism has allegedly been eradicated in the 24th century, but prejudice against alien species has been demonstrated both in TOS and TNG TV episodes and film installments. In my story, one of Worf’s chief detractors is a black man, the irony of his racism lost amid centuries of human racial enlightenment. I always thought the best of Trek raised more questions than it answered. I hardly consider this script the best of anything, but the story does attempt to raise questions, not answer them. It’s too Worf-specific to make a good movie, but it might have made an interesting set of episodes at one point and, I think, a fun comic book arc. Whatever it might have been, it is my one (and so far only) idea for Star Trek. I would really have enjoyed writing this. Star Trek Copyright © 2011 CBS Paramount. All Rights Reserved. Worf, played by Michael Dorn, is a main character in Star Trek: The Next Generation and in seasons four to seven of Star Trek: Deep Space Nine. He also appears in the films based on The Next Generation. 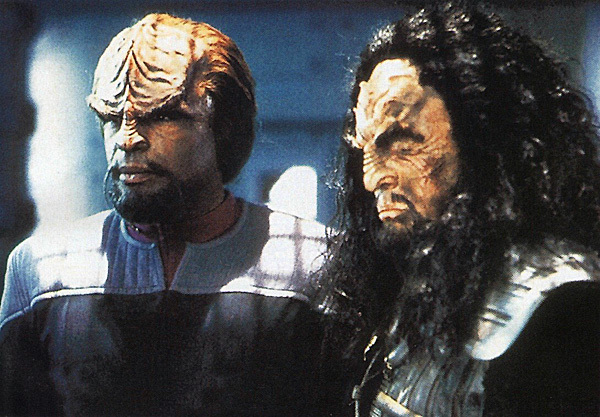 Worf is the first Klingon main character to appear in Star Trek, and has appeared in more Star Trek franchise episodes than any other character. Worf was the only character to be a regular in more than one live-action Star Trek series (While Miles O'Brien was featured in both in The Next Generation and Deep Space 9, he was not a regular cast member in the former series). Worf was at first not intended to be a regular character, since Roddenberry wanted to avoid "retreads of characters or races featured prominently in the original Star Trek series", and so the June 1, 1987 cast portrait did not include Worf. Several "tall, slim, black actors" auditioned for Worf before Michael Dorn came along, walking into the audition in character and not smiling (Indeed, Michael Dorn found the seriousness of the role, especially during the audition, at first to be uncomfortable, since he considers himself a comedian at heart). Dorn is the only Star Trek actor to have worked concurrently on the Next Generation films and the Deep Space Nine series, both of which are set in the same time period. There are scenes in First Contact and Insurrection to explain his absence and reunion with Captain Picard's officers. In First Contact Worf is initially commanding USS Defiant (NX-74205) (originally created for Deep Space Nine) before he is beamed aboard Picard's ship, while in Insurrection Picard jokes that Worf was late for his bridge shift due to being accustomed to life aboard Deep Space Nine. Dorn's most famous role to date is that of the Klingon Starfleet officer Lieutenant (later Lt. Commander and then Commander) Worf in Star Trek: The Next Generation and Star Trek: Deep Space Nine. He said he got the role by showing up at the interview with several people. He did not smile or speak or sit, but stood in a corner in rigid attention posture, like the stereotypical Klingon warrior. When called, he marched into the room, scowled, and shook the interviewer's hand sharply. After reading, he gruffly thanked the director, and walked out. He attributes this reading in character as a Klingon warrior to getting the part. Dorn has appeared on-screen in more Star Trek episodes and movies as the same character than anyone else: he appeared in 175 episodes of Star Trek: The Next Generation, missing three: "Code of Honor", "Haven" and "Shades of Gray," 102 episodes of Deep Space Nine, missing four during his time on the show: "Rocks and Shoals", "The Magnificent Ferengi", "Chrysalis" and "Prodigal Daughter" and he also appeared in five Star Trek movies, including The Undiscovered Country (not as Worf), Generations, First Contact, Insurrection, and Nemesis, bringing his total to 281 appearances as Worf. Colm Meaney is the only other person who has made over 200 appearances on Star Trek with 216 episodes; Majel Barrett had 233 "appearances" but many of these were voice only. Dorn's appearance in the film Star Trek VI: The Undiscovered Country was as Colonel Worf, representing Captain James T. Kirk and Dr. Leonard McCoy at their trial on Qo'noS and also unmasked the real assassin: Colonel West. Although never confirmed on screen, the character of Colonel Worf was intended to be the grandfather of Star Trek: The Next Generation's Worf. Dorn is also one of six actors (the other actors being Jonathan Frakes, Kate Mulgrew, George Takei, Avery Brooks and Majel Barrett) to lend his voice to Star Trek: Captain's Chair, reprising his role of Lieutenant Commander Worf. Dorn's voice deepened from his years of playing Worf. His two favorite episodes of The Next Generation are "The Offspring" and "The Drumhead". In 1995, with TNG over, the writers of DS9 came up with the idea of adding Worf to the cast in response to pressure to boost ratings. 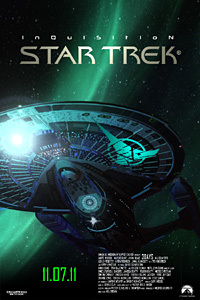 In the official comic book prequel to the movie Star Trek, Worf is a General in the Klingon Empire who is dispatched to deal with Romulan Captain Nero and his significantly altered mining vessel, the Narada. When the Klingon forces suffer a crushing defeat, Worf agrees to Nero's demand to board a shuttle and come onboard the Narada. Worf takes the opportunity to surprise Nero, cutting into the Narada's hull and fighting his way to the main bridge for a confrontation with Nero. Already prepared for such a tactic, Nero succeeds in surprising Worf by impaling him through the back with a large mechanical tentacle. When the Enterprise-E arrives to do battle with the Narada, Nero agrees to beam Worf over if the ship will lower its shields. When Captain Data agrees, Worf is beamed back to the ship, giving the Narada time to fire on the Enterprise. The ship suffers heavy damage, but manages to raise its shields in time to prevent a second attack. However, Nero leaves the battle to continue his assault on the planet Vulcan. Worf is assumed to have survived, but this is never explicitly mentioned in the comic.